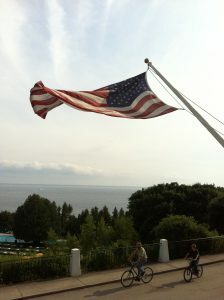 Mackinac Island is one of my favorite places on earth. I’ve worked in 13 countries and traveled to a couple dozen more, many spectacular; but, still, that speck in Lake Huron in Michigan, U.S.A., remains one of my favorite places to visit. A native Michigander, I’ve been going there since I was a kid. The only way to get there is by ferry. No motorized vehicles are allowed on the island, except emergency vehicles. Therefore, if you want to get around you walk, ride a bike, ride a horse, or hire a carriage. It’s like stepping back a hundred and fifty years in time. The small Victorian-era village is charming as all get-out. American flags dot the landscape. There are many Queen Anne, Gothic, Revival, Shingle, and other styles of “cottages,” which range in size from small to huge. Quaint inns, B&Bs, churches, and shops abound. 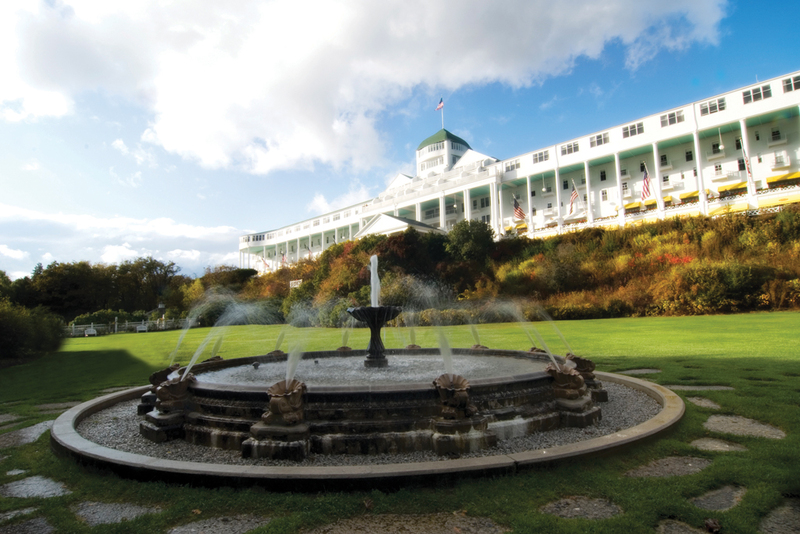 The Grand Hotel, with the longest veranda in the country, is king of the hill. With its panoramic views of Lakes Huron and Michigan, it attracts visitors from around the globe. The popular 1980 timeslip movie Somewhere in Time, starring Jane Seymour and Christopher Reeve, was filmed at the Grand and still has a large following. If you’re a fan of the movie like I am, every time you step into that hotel you’ll be struck by the emotional story of two lovers from different centuries. The history of the island is fascinating, as well. Native Americans from Iroquois tribes were there first, of course, then French fur traders, then French missionaries trying to save the rowdy fur traders, then an assortment of scallywags and fishermen, and then the British took the island and built a fort. But the French captured the fort. Rumor has it most of the British soldiers were on the mainland at the time, with their wives and children left behind at the fort. A few years later when the Brits were able to finally take back the fort, not all of the wives were happy. A few liked the French better than their British husbands. Eventually, the U.S.A. acquired that part of North America and the rest is history. The fort still stands, with reenactments throughout the summer. Well, not of the wives and Frenchmen, but of the British soldiers. It’s an 8.2-mile journey around the island, an easy bike ride, as it’s mostly flat along the shoreline. You can also ride through the hilly inland part of the island if you’re fit for a hefty trek. 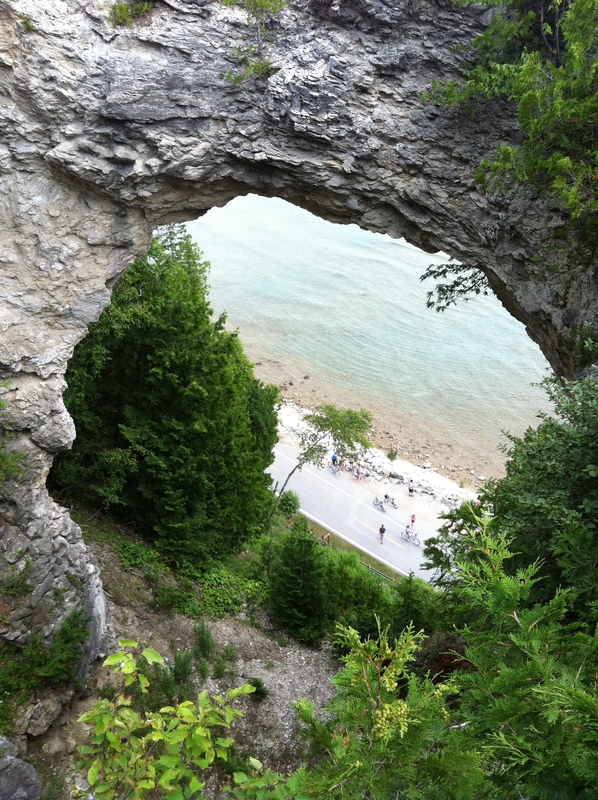 There are caves, cemeteries, rock formations, and other things to see along the way. It’s tradition to build a cairn as you go, so make sure you leave yours behind. 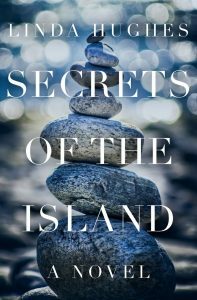 A cairn, stacked rocks, is on the cover of my new romantic suspense novel, Secrets of the Island. 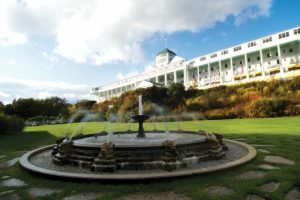 You guessed it: the story takes place on Mackinac Island. I’m thrilled to have finally written a book about this fascinating place. It’s 1943 and a Red Cross nurse sequesters herself in her grandfather’s cottage to escape the ravages of what she experienced in the war. 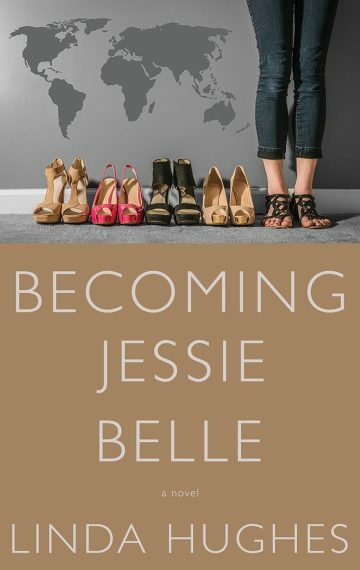 However, one family secret after another emerges to remind her that she’s not the only one with secrets to bear. 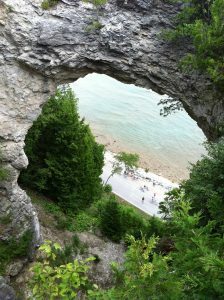 Here’s my invitation to you: go to Mackinac Island. Visit the Island Bookstore and get Secrets of the Island. Find a nice seat on a porch facing the lake, have a refreshment at hand, and let yourself slip away in time. This story will make you wonder: what secrets are buried in your family tree?